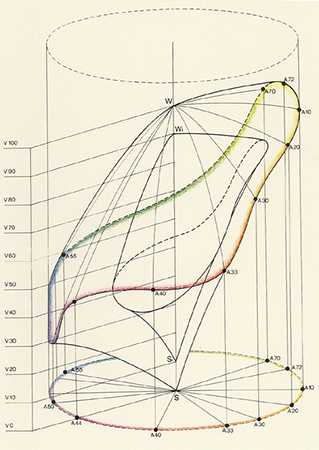 Up to the 1960’s, existing color systems were based on experiments performed in a dark room. Another method was used to create the Coloroid System. The perception of colors happened by observing colors in compositions within a wide view-field, resembling a more real life situation. Coloroid is a three-dimensional color space which is related to the CIE color measurement system using its characteristics; hue(A), saturation (T) and luminosity (V). Nowadays we all use these characteristics in Photoshop to make changes in light-intensity, brightness etc. Unique to the Coloroid system is it’s aesthetic value, due to a model based on observation conditions resembling real life. Research also included color preference, biophysical and psychological effects and colors used in different art and architectural periods. Based on results involving nearly 80,000 people, rules were formed and named the Color Harmony. With these rules designer software has been developed to create harmonious color groups. For me it’s difficult to accept the aesthetic value of this system, as I believe Color Harmony to be subjective. Also this database is created over a period of 50 years with results resembling this time period. Is this the color harmony of the past? Will we have changed our mass Color Harmony- maybe created a love for clashing colors or is Color Harmony the base on which every eye at any time period feels comfortable? As a start to the research of the aesthetic value, I tried to download some designer software based on the coloroid system. Unfortunately the software is being sold for 199 dollars and as I am not a download for free expert, I gave up the software. I found more articles on research being held based on the coloroid system and discovered architecture to be a returning subject. The coloroid system is based on tests resembling a real life situation, how can this system be translated back into the real world? 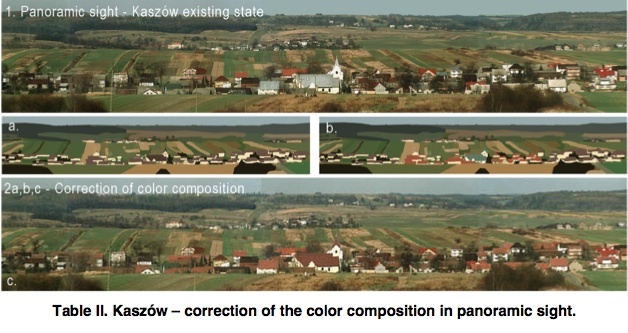 For example: a paper about color in rural architecture and landscape in Poland. The village is an example of change in architecture over the last 100 years. Color is not longer related to function. New materials are used creating a great diversity in building style, scale and proportion, which resulted in a visual chaos. Only the visual chaos, as the author is describing, is subjective; as I do not agree on the (digital) correction he shows in his paper. Websites created with software based on the coloroid system are products produced for the mass. Just as architecture is a product produced for the mass. I ask myself, what does my surroundings look like, is it harmonious to me? Over a week’s time I take photographs of street views, buildings, my surroundings. 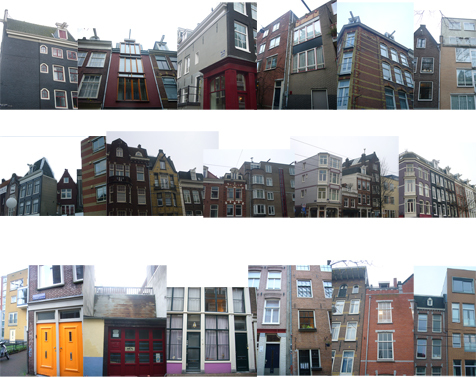 I make a collage of the pictures to get an overall view of my personal color harmony. Only, these buildings are designed by architects. They have already chosen the harmony for the people. They might have based it on the surroundings or decided to create something standing out. So my selection of the surroundings is still based on some other person’s harmony. The only way to create my harmony is to change the colors, choose the colors, and even mix the colors by my own hand to be completely harmonious to me. How do I choose the colors? How do I choose the color composition? I use the collage as a base to make different color combinations, they will be silkscreen printed on a large roll of paper, all connected. The result is a color line where you can find your harmony, going forward and backwards on the roll. A idea of what the paper roll will look like in the nearby future. Online version under construction. A while ago I found this online version of a Chinese handscroll, a panoramic view of the surroundings. Translating this ancient roll back to this our digital age is a amazing connection. So after the screen printing is done, I’m going to create an online-digital-version of my color-line, so we can either manually or digitally scroll to find our harmony. Cause aren’t we all looking for harmony? There is a blatant connection between my first and second choice. I started out with a book by Rem Koolhaas called Project On The City which is a collaboration with several students from the Harvard design academy where he holds the position of professor. This Project investigates the consequences of the unbridled urbanisation taking place all over the world. In this context the meaning of the word urbanisation go’s further than just the focus of human inhabitancy in city’s but also refers to the cancerous growth of commercial landscapes which are framed by concrete walls becoming the centre and at the same time the banks of a river of ongoing development. One of the problems stated in the book being that the design professions can not keep up and apply outdated methods to the urban landscape creating a chaotic and unpleasant maelstrom of overlapping visual and audio stimuli with which the citizen (caught up in this maelstrom) is forced to deal. Then I found my second book. City Signs and Lights by Stephen Carr (almost completely) coincidentally dealing with the exact same problem but focusing it’s attention on the problem with -and the potential of (the name says it all) City Signs and Lights. Rarely have I seen two books that complement each other more (although not always in the most constructive manner) and the focus on the bewildering aspects but also the potential of urban public space is a connection that fascinates me deeply.